At the Council Meeting, Monday 15th June, last, council unanimously supported the new planning and zoning schedule C157. 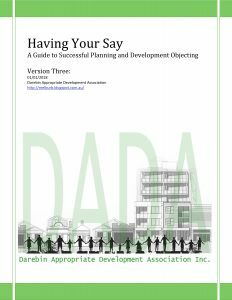 You can look at what was said on the archived minutes but more importantly take a look at Item 8.1 from the agenda for that meeting.Go to the Darebin website, click council meetings then agenda’s and minutes. It is the revised housing strategy, quite a big document to download. Amendment C152 begins on page 114 and there is a map on page 121 that shows where the new zones are proposed. For many of you it will mean more protection from the development madness that has gripped Darebin in the last 5 or so years. It is a vast improvement on what that previous planning minister allocated us but still not the 80% NRZ we wanted. We now have NRZ1 and NRZ2. The most protection is afforded by NRZ1 and I don’t think there has been much increase in that level of protection from C144. There will be a process where we can all have a say in one form or another. Those of us who presented at the Panel Hearing on C144 should be notified personally. Please take the time, when you have a chance to read and think about these new new zones and annoy the hell out of you local councillors about anything you don’t like!! !